ONE OF THE ONLY FACILITIES IN THE U.S. TO HAVE ALL FAT REDUCTION & TIGHTENING TECHNOLOGIES - COOLSCULPTING, ULTRASOUND, RADIOFREQUENCY, MESOTHERAPY & LIPOSUCTION. 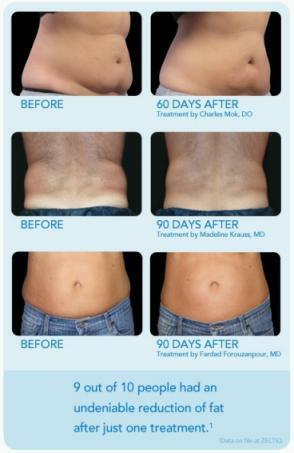 CoolSculpting™ is a new, non-invasive way to reduce fat using a patented cooling technology. The result is a noticeable, natural-looking reduction of fat by 20% on any pocket, such as the love handles, upper and lower abdomen, and back fat. It is the only FDA-approved technology for fat reduction, making it both safe and effective. Developed from breakthrough research by world-renowned dermatologists Dieter Manstein, MD and R. Rox Anderson, MD of the Wellman Center for Photomedicine at Massachusetts General Hospital, a teaching affiliate of Harvard Medical School. Best candidates are near their ideal body weight with diet- and exercise-resistant fat bulges. If you are seeking spot reduction for specific areas of fat but are not considering a surgical procedure, CoolSculpting may be right for you. CONSULTATION EVALUATION IS VERY IMPORTANT WITH ZELTIQ. This procedure is very effective for local fat bulges ONLY in certain areas - MID- ABDOMEN, LOVE HANDLES, & BACK OF THE THIGH BANANA ROLLS. It is NOT for diffusely fat individuals; It is for relatively fit or slim folk with hard to loose fat pockets. Bring some videos or CD's to help enjoy the relaxing 1 - 3 hour experience (depending upon number of areas to be treated). Our treatment room is set up for audo/visual pleasure. Patients may start to see changes as quickly as three weeks after their treatment, and will experience the most dramatic results after two months. Their body will still be flushing fat cells at that time, and will continue doing so for up to five months. MANY patients have enough improvement from ONE TREATMENT; some, with more pronounced bulges, do a 2ND TREATMENT after 4 months, having shown improvement but wanting more. The CoolSculpting procedure is completely non-invasive, so you can return to normal activities immediately. THERE REALLY IS NO DOWN TIME. Patients can return to normal activities the next day. DEVICE THAT CAN YIELD COMPARABLE RESULTS. Results can be seen as soon as three weeks following treatment, with the best results occurring over the next two to four months. We are the only office in Los Angeles to supplement CoolSculpting by Zeltiq treatments, when applicable, with Med-Sculpt ultrasound. The ultrasound technology helps with fat reduction and is a valuable treatment for cellulite.